THE SETTING SUN dropped a blanket of sparkling gold across the atmosphere. The sky was a swirl of pink clouds with velvety purple undertones, a radiant background for a small, filthy house. Mommy&apos;s house was brick with vines growing on the sides and dirt coating the dingy, wired fence surrounding it. Bella couldn&apos;t stop staring at the contrast between the wonderful sky and the house with many secrets. Bella could hardly breathe as she continued to stare back in worry at the house - it was her first time seeing the outside of the small building. Her legs were trudging as quickly as they could through the thick, unkempt grass but she couldn&apos;t find the energy to continue. Cole and Elliot were both so weak, especially Cole. He was doubled over and panting, with a flushed face and sweat beading down the edges of his temples. 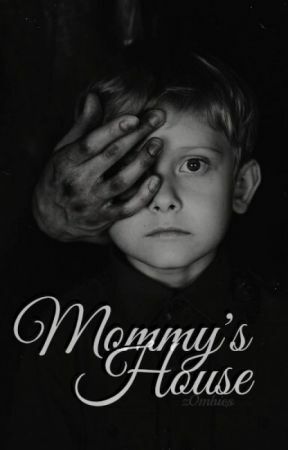 His bare chest glistened with sweat, as did his arms as he slammed his fist on the door to the only house across from Mommy&apos;s.
Cole continued to look behind his shoulder, in fear that Mommy would be running towards them. "Maybe this isn&apos;t a good idea - we&apos;re right here where she can see us. We should," he paused, panting and swallowing, "-we should go and see if there&apos;s a door in the back or a window we could break," he suggested through heavy breaths. "We can&apos;t just break into somebody&apos;s house," Bella retorted, glancing at Mommy&apos;s house in fear again. Cole shook his head, "We don&apos;t have a choice." Bella sighed in defeat, unsure of what else they would do. She grabbed Elliot&apos;s hand, and Elliot&apos;s small fingers clenched around hers while they sprinted down the creaky steps. They moved to the side of the house, where there was a tall fence blocking the large backyard. "We have to climb it?" Elliot&apos;s small voice asked, fear filling his large, honey eyes. Cole rubbed his eyes, "I don&apos;t think I can," he said. "But I&apos;ll try." He was incredibly weak and had his hands on his knees as he took deep breaths, and Bella felt awful as she locked her fingers around a small slot in the wire fence. Cole stepped in front of Bella, and Bella&apos;s eyes studied the deep slices across his back - which was entirely covered with a mixture of healed and unhealed wounds. She pouted and looked away, listening to the sound of his fingers hitting the metal fence as he gripped a slot. He grunted and tried to hoist himself up, but he gave up and shook his head. "I can&apos;t," he said, his voice shaking. "I- I can&apos;t do anything else." "Maybe we should try a different house," Bella lifted her shoulders. Cole tilted his head, "Oh, yeah?" he asked, furrowing his eyebrows. "Where? Where do you see another house? All I see is trees around us." Bella stared at him in defeat, "Fine. I will climb the fence and try to unlock it, okay? Just-"
Bella was cut off when an angry, deep voice suddenly shouted from the other side of the fence. "¿Qué están haciendo los niños? ¡Sal de aquí! ¡Vete!" An angry, elderly man with mocha coloured skin and sunglasses over his eyes walked over to the three of them, pointing his finger in their direction. "¡Tengo un perro enojado que le rasgará a los pedazos si usted viene en este césped!" Bella dropped to the ground, landing on her feet as she moved closer to Cole in fear. Elliot was huddled between them, hiding behind Cole&apos;s leg as the three of them stared at the man. None of them knew what he was saying, but they knew that he was angry by his threatening, fast tone. "We need help!" Bella cried out, looking around the woods surrounding them. "We need help! Please, let us use a phone!" "¿Quién eres tú? ¿Qué estas diciendo?" The man spoke, tilting his head to the side.